The Islanders, who lost back-to-back games in regulation for the first time since Dec. 4-6, are just 1-3 on their current homestand. So far, so very good for Barry Trotz. But now is the time for him to truly earn his Jack Adams Award as the NHL’s Coach of the Year, to earn his salary, to earn the enduring love and respect of Islanders fans. 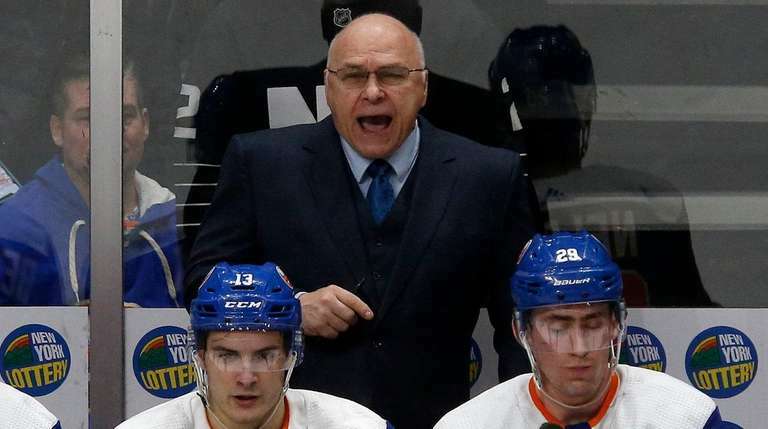 After Sunday’s dispiriting 4-1 loss to the Flyers at NYCB Live’s Nassau Coliseum, Trotz finds himself still one victory short of becoming the fourth NHL coach with 800 career victories, and with a team in an ill-timed slump. The flop against the Flyers dropped them to 1-3 on their homestand — 0-3 in games in which John Tavares was not in the building to provide fans with verbal target practice. It also dropped them out of first place in the Metropolitan Division for the first time since mid-January, thanks to the Capitals, Trotz’s former team, beating the Rangers in a shootout on Sunday afternoon. So, to review: The Islanders have lost back-to-back games in regulation for the first time since early December, meaning Mr. 799 will need at least three tries to reach 800. After the game, Trotz was more philosophical than angered, noting that good teams tend to have 10-game stretches in which they dominate as well as other 10-game stretches in which they do not. This is one of the latter. This certainly is no time to panic, with the Islanders having a game in hand over the Capitals and still in fine position to make the playoffs and perhaps make some noise there. But their star, reigning-Stanley Cup-champion coach is the point man for turning this thing back around, especially in the absence of a superstar veteran such as Tavares in the dressing room. Betting against Trotz would be unwise, and four of the next five games are at home, starting with the Senators on Tuesday night. Still, Islanders fans burned by decades of disappointment are hereby authorized to be concerned. 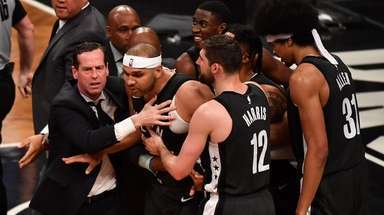 Part of this is simply the ups and downs of a long season. Part of it is that the Islanders no longer sneak up on anyone. When asked before the game if opponents are taking his team more seriously now, Troitz said, “Yeah, absolutely. Early in the year, I didn’t think there were a lot of expectations around the league of what the Islanders were going to be, or are, and the second half, we’ve been in the upper echelon for a good portion of that. “I think everybody understands what we do well, so they put a little more time into it. But I think your opposition has a lot more respect for you . . . The Islanders were not all bad on Sunday, but they showed just enough defensive indifference to allow the visitors to take and keep an early lead. Trailing 2-0 after one period, they had the better of the play in the second, yet it ended with them trailing 4-0 and with a smattering of boos despite no sign of Tavares in the building. The regular season ends a month from Wednesday. This is no way to be approaching playoff time. February is the NHL’s dog days. March comes at you fast. “This time of year, everybody should get excited,” Trotz said. “It gets ramped up to a different level; make sure that we can raise our level. I thought we’ve played a high level of game all year. Can we raise it even more? Tuesday would be a good night to start.